I made a mistake this afternoon. A couple nights ago, I DVR’d Ice Cream Paradise on The Travel Channel. Since I couldn’t really find anything worth watching this afternoon, I decided to catch up on some of my recorded shows. J happened to be not taking a nap while I was watching the show and started craving ice cream. I wasn’t craving, but I wouldn’t argue if she wanted to make an ice cream run. 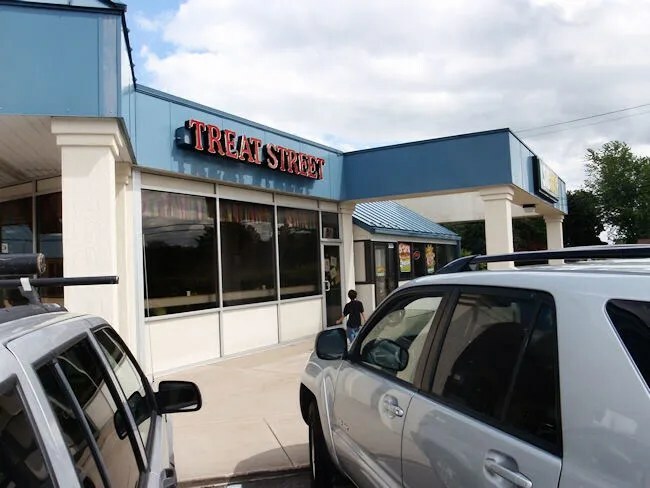 The first place I thought to fill that ice cream craving was Treat Street in the Oakwood Plaza on the corner of Oakland Drive and Whites Road in Kalamazoo’s Oakland/Winchell neighborhood. The store is sort of a throwback to an old fashioned ice cream parlor set in the modern strip mall. They have the traditional ice cream case and soda fountain, but there’s also a walk up window so you don’t have to tie your dog to a pole outside. There is a counter that takes up a large portion of one side of the room. We headed straight for the ice cream case which stocks Sherman’s Ice Cream. We needed a few minutes to look over the list of flavors before making the all important decision of which ice cream we were going to consume this afternoon. 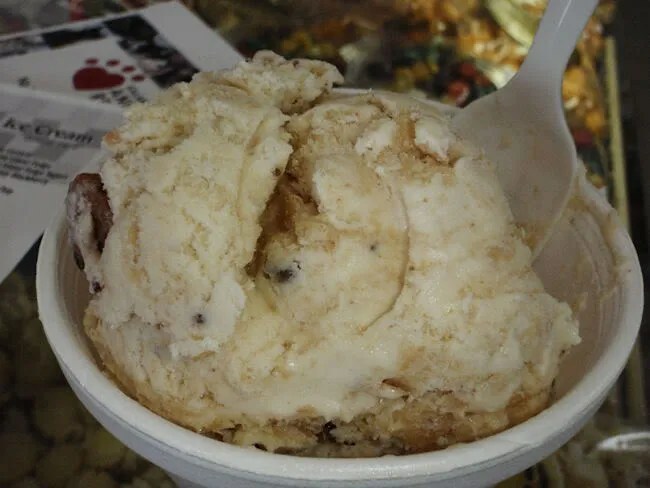 I initially gravitated towards the Root Beer Barrel Float ice cream, but who am I kidding? They have a Peanut Butter Ice Cream sitting right up front. That’s eventually what I decided on. I got two scoops in a cup and immediately dug in. J went with a two scoop waffle cone. She got one scoop of the Root Beer Barrel Float and one scoop of Milky Way. She loved both flavors. She offered me a bite, but I was actually getting pretty full on my own two scoops. J also wanted to take advantage of the soda and ordered a Vanilla Soda. She wasn’t quite on the same page as Treat Street with this one. She thought she was getting something similar to a vanilla phosphate, but as the lady was making it, she asked J if she wanted Vanilla Ice Cream. J didn’t want anymore ice cream, she was just looking for a Vanilla Soda. Without the ice cream, the soda was really warm. They didn’t put ice or anything in it, but my guess is J confused the girl when she said she just wanted the soda. There is a self serve Coke machine in the dining area. She asked me to put some ice in it to see if we could save it. She ended up taking it home and pouring some more Coke in it to make a Vanilla Coke. Not exactly what she had in mind, but now we know. 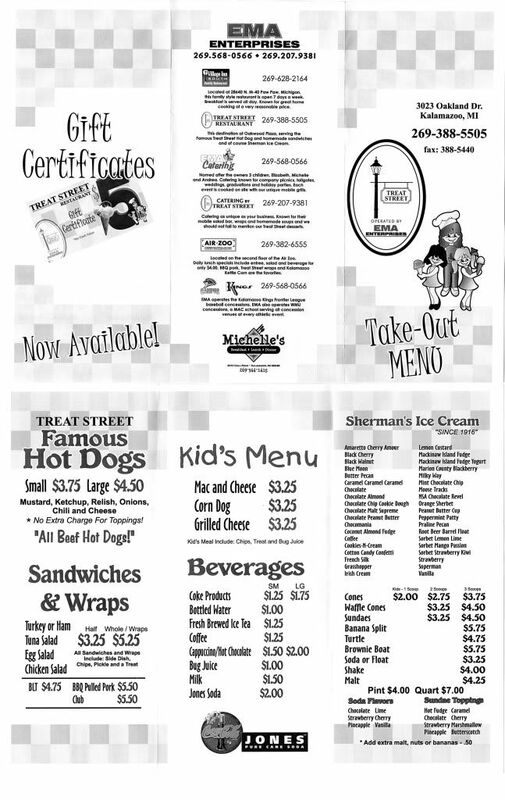 Other than ice cream, Treat Street offers a limited food menu. They have “famous” hot dogs and a couple sandwiches or wraps. There is also cotton candy, movie theater style candy, and Kalamazoo Kettle Corn. 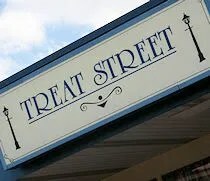 Our impromptu trip to Treat Street set us back about ten bucks. More importantly thought, it satisfied the ice cream craving. That’s what I get for watching The Travel Channel. A friend told me that there’s a combination Deli-Pizza-Ice Cream place on the West side of Shaver Road, about 1/4 of mile north of Red’s Grill. He claims it has great pizza and ice cream. Has anyone heard of this place? 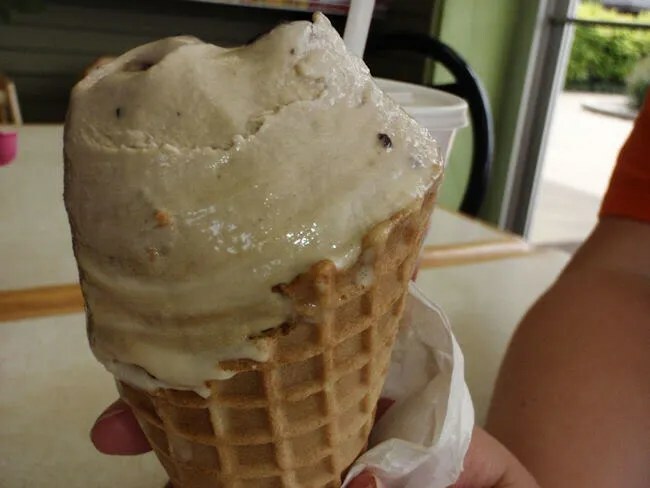 Does the Ice Cream they serve use real sugar or High Fructose Corn Syrup [HFCS]? I stopped buying Ice Cream at the Quality Dairy as their supposedly Premium stuff is all HFCS.